Window Repair Man → Blog → Foggy Windows → Decora Windows the Worst Company Ever! Do you have Decora windows and doors installed in your home? Decora Windows and Doors, was a window and door manufacturer based in Concord, Ontario that if awards were given for worst window manufacturer they would be clear winner of a gold medal. When we learn of home owners that have just moved into a home only to realise their windows are not opening or closing properly we really do feel for the owner because we wish Decora windows on anyone. 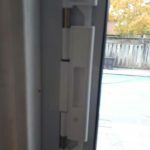 Customer service was almost zilch, also Tarion did little to help homeowners when their Decora windows start going foggy after only 1 year. What were the builders thinking when they chose Decora to install windows. If these windows were part of a car there would be a recall, but because its part of your biggest investment … no one cares! Decora windows and doors really did set the bar very low when it came to quality and service, there is no way they could have gone any cheaper without using plexiglass and a few pieces of 2×2″ wood. The spacer bars are steel and have a tendency to rust out like the photo shows. 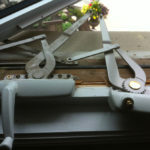 They used cheap, really cheap window operator cranks made in China, these window cranks are not made of the best materials and have a tendency to break, gears lose teeth and the window crank housing buckles under force and again gears fall out of mesh. 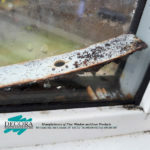 Decora windows will leak sooner than most owners with Decora windows would like! 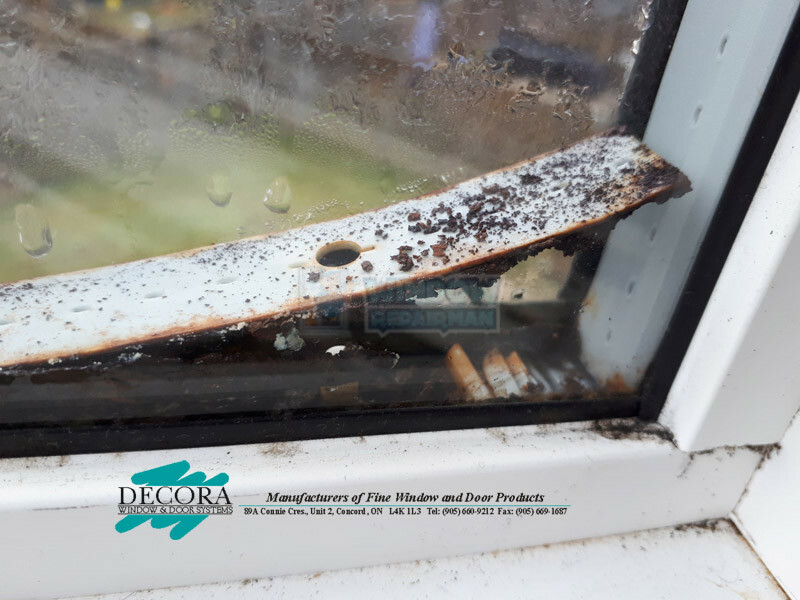 We have seen spacer bars that are almost completely rusted out on the bottom part of the window the only way to fix your Decora windows that are foggy is to replace the double pane thermal units. There are some companies who will try to drill the glass, spray in a cleaning solution and then apply 2 one way valves or sieves as they are also known. There is no guarantee that drilling and cleaning will work as the process needs to dry out so as to clear the fog this can take a long time due to weather conditions. Replacing the Insulated Glass Units (IGU) is the best way to address foggy window and your Decora windows. All thermal units replaced have 5 years warranty against any defects. 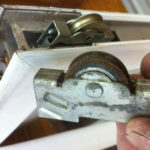 Decora window cranks can be replaced with better working versions that are not cheap Chinese copies. If your Decora windows are driving you crazy why not call Window Repair Man. We can repair your Decora windows thus saving your money and removing the need to replace those windows. 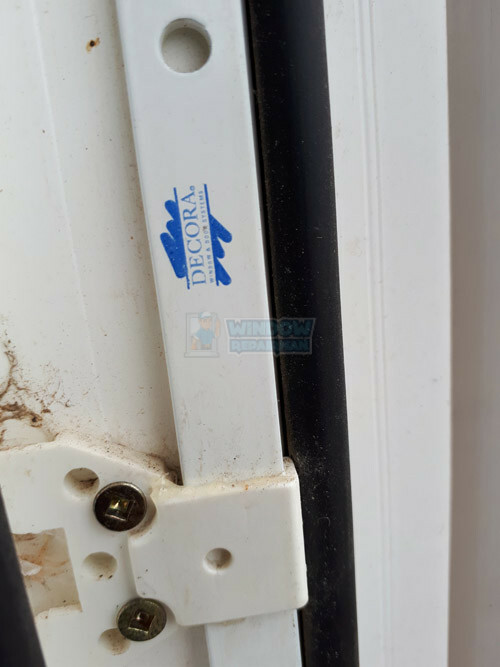 Normally you can identify if you have Decora windows by looking at the spacer bar between the glass, you may see the name pressed into the metal, failing that the window parts had their logo printed on. There are a lot of home owners effected by their builders poor choice in choosing to have Decora windows installed. We have for years been saying that builders should be giving home owners a log book showing who did what in their home, this would make companies more accountable. New Aspen Ridge home in 2008 with all new windows. After 1st year, seal breaks on one window and we have condensation between both panes of glass. With some fighting through Aspen Ridge and Decora, Decora replaces the window. Fast forward to 2013 and one-by-one the windows are all resulting in broken window seals and condensation inside the window panes. Decora is out of business and Aspen Ridge replies with a one liner of a new company they’re dealing with (1. Not that we’re covered (i.e. likely out-of-pocket expense, 2. How much do I trust a new company that Aspen recommends when the previous one ran out of dodge?). While I am disappointed in Decora, I am probably more disappointed in Aspen Ridge. Our windows look like they are all fogging up. I understand this is a leakage of the gas between the panes. We used Decora Windows throughout when we built our house. I should have addressed it when I saw it in the first year but I didn’t realize it was due to faulty window construction. I have not yet talked to Decora but from what I have seen in blogs, my chances of getting them all replaced seems nil to none.